I developed this recipe with the help of my niece Thea. We had a great time in the kitchen together. I just wish she didn’t live so far away. I think we could make a great recipe testing team. Inspired by the once fried McDonald’s apple pies, I think you will see that we get pretty close, minus the deep fried part. One could almost argue these are good for you in comparison! Start by preparing your filling: Peel and core the apples and finely chop the flesh into ½ inch cubes. Transfer to a bowl and toss with the lemon juice (this will help keep the apples from discoloring). Add the sugar, cinnamon and nutmeg to the bowl and mix well. Transfer the apples to a pot and place over medium heat. In a small bowl, whisk together the cornstarch with ¼ cup of water until completely smooth. Add to the apples and stir to combine. Bring to a slow simmer, stirring occasionally, until the sugar dissolves, the apples soften slightly, and the liquid thickens and coats the apples, about 10 minutes. Remove from the heat and allow to cool. Working quickly to prevent the pastry from drying out, lay 1 sheet of filo dough on a clean work surface with the short side facing you. (Keep the remaining sheets of filo pastry wrapped in plastic while you work). Brush the whole surface with olive oil or melted butter and lay another sheet over top. Continue this process until you have 4 stacked sheets, making sure to brush each sheet with more olive oil or butter, including the top sheet. Using a knife or pizza cutter, cut the stacked sheets in half lengthwise, and then each half in half again so you are left with 4 long, narrow strips. Spoon a dollop of the apple mixture at the bottom of one of the strips, leaving a small border around it. Imagining the apple mixture as a square, fold the bottom left corner of the strip up and over the apples to upper right hand side of the square to create a triangle shape at the bottom of the strip. Next, take the bottom point of the triangle and fold it upwards, keeping the triangle shape. Next, fold the bottom right corner of the triangle up and over to the left side of the strip, again keeping the triangle shape while folding upwards. Continue in this manner, keeping the triangle shape each time you fold until you reach the top of the strip. 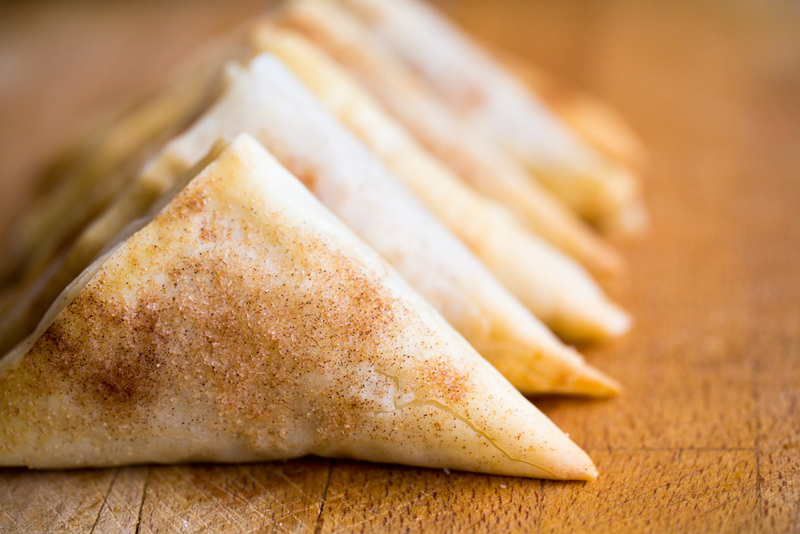 Brush the outside of the triangle with more olive oil or melted butter and sprinkle all over with cinnamon sugar. Place on the lined baking sheet. Repeat this process with the remaining 3 strips, and then with the remaining filo sheets, stacking 4 at a time, cutting the stacks into 4 strips, filling, and folding until you have used all of the apple mixture. Depending on how much apple mixture you use for each turnover, you should end up with between 10 and 12 filled turnovers. Transfer the tray of turnovers to the oven and bake for about 15 minutes or until the filo is golden all over. Allow to cool slightly before serving as the filling gets quite hot during baking.